We publish on a broad range of topics, including holistic models of learning and instruction, social emotional learning, prevention, and adverse childhood experiences (ACEs). Short bios provide information about our respective areas of scholarship and expertise. Herrenkohl, L. R., & Mertl, V. (2010). Description: Studies of learning are too frequently conceptualized only in terms of knowledge development. Yet it is vital to pay close attention to the social and emotional aspects of learning in order to understand why and how it occurs. 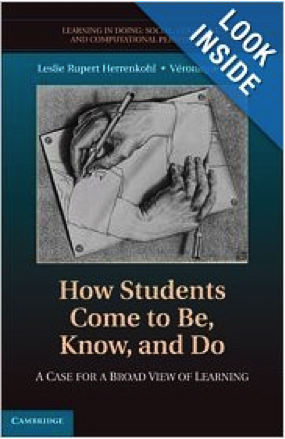 How Students Come to Be, Know, and Do builds a theoretical argument for and a methodological approach to studying learning in a holistic way. The authors provide examples of urban fourth graders from diverse cultural and linguistic backgrounds studying science as a way to illustrate how this model contributes to a more complete and complex understanding of learning in school settings. What makes this book unique is its insistence that to fully understand human learning we have to consider the affective-volitional processes of learning along with the more familiar emphasis on knowledge and skills. Developing interest, persisting in the face of difficulty, actively listening to others’ ideas, accepting and responding to feedback, and challenging ideas are crucial dimensions of students’ experiences that are often ignored. Description: Public and academic interest in youth and community violence has grown with school shootings, horrific cases of child abuse, and reports of domestic abuse becoming regular news features. Research on interpersonal violence has had a corresponding progression, but there is a tendency by researchers to examine these issues at the individual level, rather than considering the micro- and macro-level causes, correlates, and outcomes for those affected directly and indirectly by violence.Edited by four leading violence researchers, Violence in Context takes the more systemic view, offering a critical appraisal of research and theory that focuses on violence in youth, families, and communities. Authors investigate the ways in which violence is defined and understood, how risk and protective factors promote and inhibit violence in the groups most responsible for the socialization of youth, and how violence and related behaviors differ by gender, race, and ethnicity. A rich analysis of the field familiarizes readers with some of the most compelling approaches to violence prevention, including interventions that begin at infancy with families at risk. 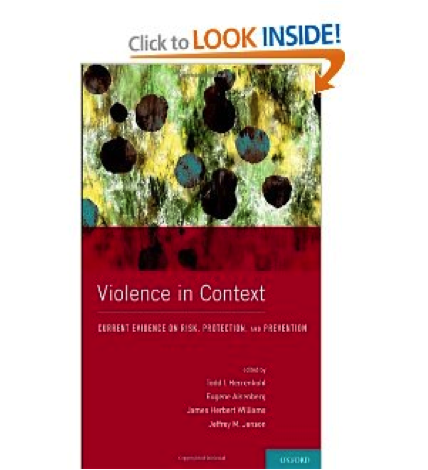 Every chapter examines the latest research on violence prevention, with a goal of moving towards the multi-system, integrated intervention models and approaches that will incorporate the social context of violence across settings and population subgroups.The result is a valuable interdisciplinary book for scholars, practitioners, and students that provides a comprehensive overview of published studies, limitations of research findings, and a thoughtful discussion of the ways in which future research can build on what is currently known about the causes, consequences, and prevention of violence in different settings. Herrenkohl, T.I. (2013). Person-environment interactions and the shaping of resilience. Trauma, Violence, and Abuse special issue: Developmental Foundations of Resilience and Positive Coping in Children Exposed to Violence and Chronic Stress, Trauma, Violence, and Abuse, 14 (3), 222-234. Herrenkohl, T.I., Walker, S., Lockhart, M., Sidorowicz, G, McGlynn-Wright, A., Bishop, A. (2014). Using an innovative developmental evaluation framework to promote the use of evidence-based practices and programs in violence prevention: The Seattle Youth Violence Prevention Initiative. Published as a Methods in Action case for a Sage Research Methods Case series. Herrenkohl, T.I., Herrenkohl, L.R., Benner, J., Proulx., M.A., & Calvo, N. (2014). Research-Practice Partnership to Support Social Emotional Learning in Schools. Published as a Methods in Action case for a Sage Research Methods Case series. Hemphill, Sheryl A., Tollit, Michelle, Herrenkohl, T.I. (2014). Protective factors against the impact of school bullying perpetration and victimization on young adult externalizing and internalizing problems. Journal of School Violence, 13 (1), 125-145. Herrenkohl, L.R. & Cornelius, L. (2013). Investigating Elementary Students’ Scientific and Historical Argumentation. Journal of the Learning Sciences, 22(3), 413-461. Cornelius, L. Herrenkohl, L.R. & Wolfstone-Hay, J. (2013). Organizing Collaborative Learning Experiences Around Subject Matter Domains: The Importance of Aligning Social and Intellectual Structures in Instruction. In Hmelo-Silver, C. E., O’Donnell, A.M., Chan, C. and Chinn, C. A. (Eds. ), The International Handbook of Collaborative Learning (pp. 333-350). New York, NY: Taylor and Francis. Evans-Whipp, T. J., Plenty, S. M., Catalano, R. F., Herrenkohl, T. I., & Toumbourou, J. W. (2013). The impact of school alcohol policy on student drinking. Health Education Research, 28(4), 651-662. Herrenkohl, T. I., Klika, J. B., Brown, E. C., Herrenkohl, R. C., & Leeb, R. T. (2013). Tests of the mitigating effects of caring and supportive relationships in the study of abusive disciplining over two generations. Journal of Adolescent Health. Special issue: Interrupting Child Maltreatment Across Generations Through Safe, Stable, Nurturing Relationships, 53(4 Suppl. ), S18-S24. Klika, J. B., & Herrenkohl, T. I. (2013). A review of developmental research on resilience in maltreated children. Trauma, Violence, and Abuse, 14 (3), 222-234. Herrenkohl, T. I., Hong, S., Klika, J. B., Herrenkohl, R. C., & Russo, M. J. (2013). Developmental impacts of child abuse and neglect related to adult mental health, substance use, and physical health. Journal of Family Violence, 28, 191-199. Herrenkohl, T.I., Klika, J.B., Herrenkohl, R.C., Russo, M.J., & Dee, T. (2012). A prospective investigation of the relationship between child maltreatment and indicators of adult psychological well-being. Violence & Victims, 27, 764-776. Herrenkohl, L.R., Tasker, T., and White, B.Y. (2011). Developing Classroom Cultures of Inquiry and Reflection Using Web of Inquiry. Cognition and Instruction, 29(1), 1-44. Herrenkohl, L.R., DeWater, L.S., and Kawasaki, K. (2010). Inside AND Outside: Teacher-researcher collaboration. The New Educator, 6(1), 74-91. Gottlieb, E., Herrenkohl, L.R., Wortham, S., Rhodes, C., Packer, M., & Gonzales, M.R. (in press). Connecting Learning and Becoming: Studying Epistemologies and Identities as Interconnected, Dynamic Systems. In Penuel, W., Jurow, S., & O’Connor, K. (Eds. ), Proceedings from the International Conference of the Learning Sciences, 2014. Morozov, A., Herrenkohl, L., Shutt, K., Thummaphan, P., Vye, N., Abbott, R., Scalone, G. (in press). Emotional Engagement in Agentive Science Learning Environments. In Penuel, W., Jurow, S., & O’Connor, K. (Eds. ), Proceedings from the International Conference of the Learning Sciences, 2014.